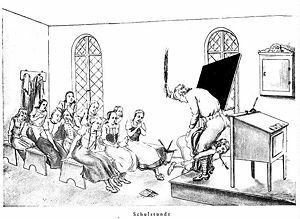 Schulstunde (School lesson), M/f school birching drawing by Helga Bode. Helga Bode, as far as can be gathered, was a female German artist who created a lot of spanking art (drawings and watercolor paintings) in the 1920s. Besides spanking and related corporal punishment scenes, she also drew enema and bottom fetish scenes. Her range of age and gender combinations varies widely; her most common ones are F/f, F/F, F/m, M/F, and M/m. The scenes depicted range from historic to contemporary of her time. Little is known about the artist. A number of her works were published as illustrations in German semi-scientific sexology publications in the 1930s, but these were not commissioned illustrations; rather, the artwork was probably given to the publishers by Helga Bode's former psychotherapist whom she had entrusted with a considerable number of her drawings and paintings. The titles below are those from the 1930s sexology publications and are probably titles or captions given by the author and not by Helga Bode herself.